The Rev. Dr. Alexander Gee, Jr. (left) of the Nehemiah Center for Urban Leadership Development receives Associated Bank’s donation presented by Jay Sodey (right). 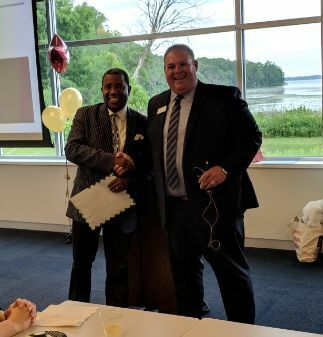 Associated Bank and its employees are working with the Nehemiah Center for Urban Leadership Development to prepare and connect emerging African American leaders with opportunities in the greater Madison area. It’s part of Associated Bank’s commitment to meeting the unique needs of diverse populations. “We are proud to support the Nehemiah Center’s efforts to develop and empower African American individuals, families and communities,” said Jay Sodey, district manager, Associated Bank, and volunteer with the Nehemiah Center. On June 11, Sodey extended Associated Bank’s support with a $5,000 donation. These funds will help offset tuition fees for Nehemiah Center’s Justified Anger Leadership Institute — a nine-month program that meets one full day per month in which participants build leadership skills while developing and implementing community-based programs.